The EMX7 and EMX5 models feature a built-in high-efficiency power amplifier of 2 x 710W and 2 x 630W of output power respectively. Despite their low power consumption, these amps are capable of very high volume output, yet still manage to remain surprisingly lightweight. Both models also come equipped with an onboard overload protection function to improve reliability and prolong component life and performance quality. 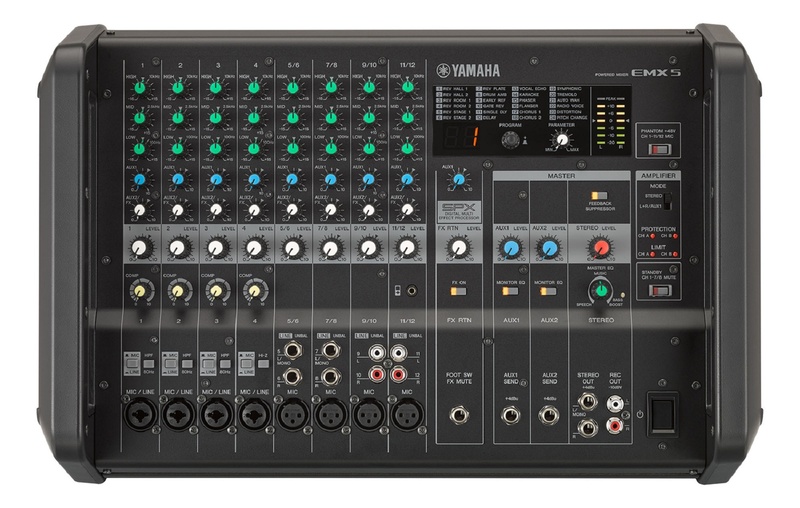 Both the EMX7 and EMX5 are equipped with four mono input channels and four mono/stereo input channels, allowing up to 8 microphones, and line-level devices such as keyboards and portable playback device to be connected to each channel. In addition, channel 4 can be used with Hi-Z inputs to connect instruments such as guitars or basses directly. Each model is also equipped with 2 AUX SEND connections for a monitoring system or external effect devices, REC OUT unbalanced RCA pin output jacks to connect an external recorder, and STEREO OUT TRS phone jacks to output the mixed stereo signal. The speaker processor function allows you to select an appropriate setting to match the particular speakers you`re using. 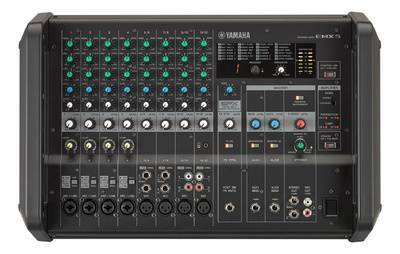 It features presets specifically tuned for each model in Yamaha`s extensive lineup of passive speakers, including CBR, Club, A and R series. This allows users to optimize speaker performance and save even more time during system setup. It also includes a bass boost function that can be enabled to significantly bring out the lower frequencies. EMX7 is equipped with Flex-type graphic equalizer (Flex9GEQ) that allows you to select up to nine bands out of a total of 31 for fine tuning from minus to plus 15 dB. EMX5`s 1-Knob Master EQ lets you apply optimized EQ settings with the simple turn of a knob. The SPEECH setting is geared towards meetings, seminars, or conferences with a limited lower end for clear, defined speech, MUSIC offers a more balanced sound tailored to acoustic or band performances, and BASS BOOST is ideal for DJ performances or audio playback that puts a priority on emphasizing the base sound. EMX7/5 is equipped with the popular 1-knob COMP function used in MGP and MG series models. By simply operating a single control, it is possible to get optimal compression for vocals and instruments. As the [COMP] control is turned to the right, the threshold, ratio, and output gain are adjusted simultaneously. Box-type robust and portable powered mixer featuring high efficiency power amplifier of 630W and mixer with comprehensive effects, 1-Knob Master EQ and built-in feedback suppressor.